Apartment space is at an all time premium in urban areas, so living in tiny shoebox apartments has become the norm. Often this means sacrificing comfort, so it’s always nice to see small apartment designs, which take this problem on and create cozy and comfortable living solutions. 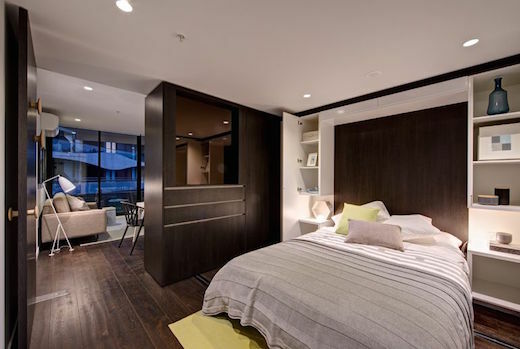 One such is the so-called New Convertible Spaces apartments in Melbourne, Australia, which feature movable walls to either open up the living space or divide it up to create a separate bedroom area. 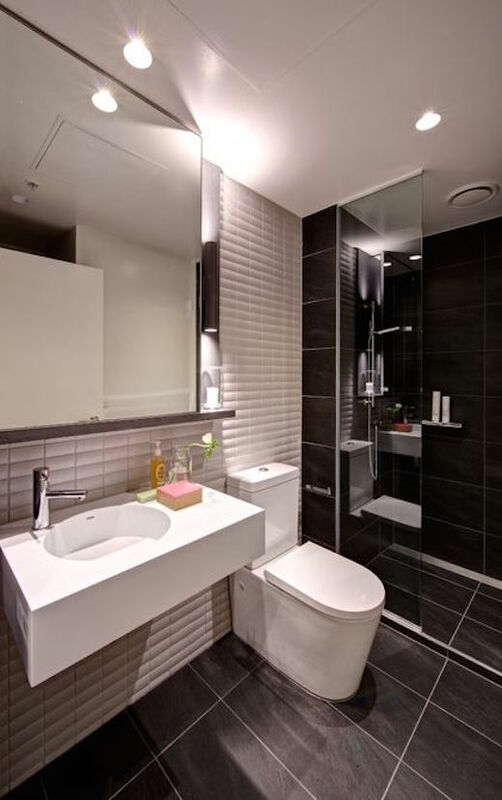 The design of the New Convertible Spaces apartments is focused on luxury too, not just usefulness. They are aimed at young professionals who wish to live in high-quality apartments in a premium location, but can’t afford more than one-bedroom apartments. 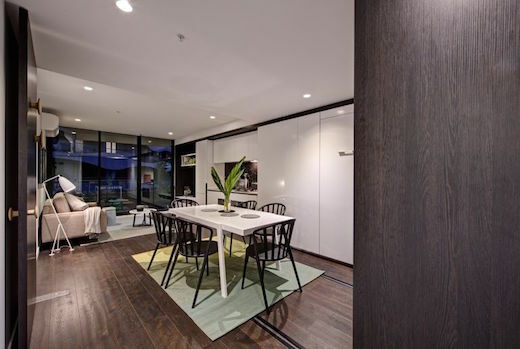 The first set of Convertible Spaces apartments are located at the 210,843-square foot (19,588-sq m) Sanctuary on the River development near Melbourne. 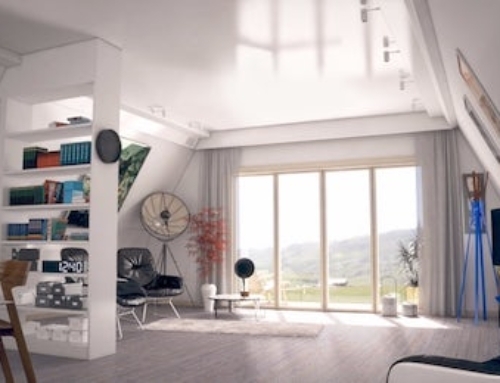 The Convertible Spaces approach is able to provide open-plan living in small apartments, by turning areas such as corridors into functional living and sleeping spaces without restricting access to the rest of the apartment. 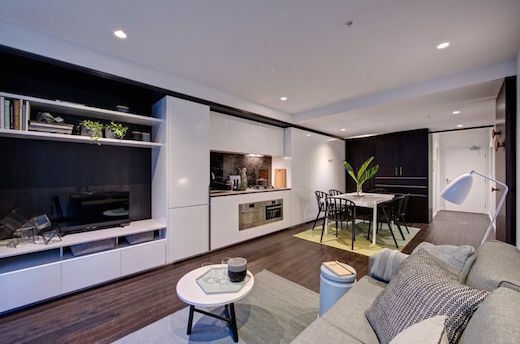 In daytime, the typical Convertible Spaces apartment consists of a large kitchen/living/dining area, along with a wall unit with an integrated TV. The kitchen is fully equipped and everything is optimized with space saving in mind. The kitchen table, for example, can be moved out of the way and folded down when not in use. There is also a moveable wall, which can be pulled across the space to divide it in half, creating a separate room. This is the bedroom, which features a bed that folds down from the moving wall, as well as doors that can be closed for privacy. The Sanctuary on the River development also has a number of other premium features, such as a lobby with a bar, a rooftop dining space, a lounge, and a cinema. There is also an onsite gym, as well as a pool, spa, sauna, a massage center and more.